~Tufted Titmouse – tufted dark gray head, straight black bill, whitish gray underparts, gray upper parts, rusty sides and flanks, gray tail. 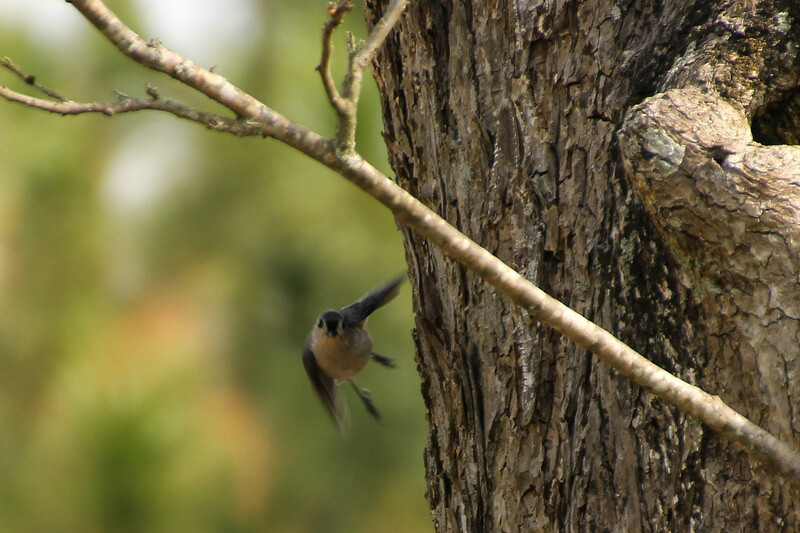 As I sat on my coach sofa looking out the window on The Farm, I observed many species of birds flying in and out of a cavity in a large, old Pecan tree with this Tufted Titmouse being one of them. Notice the cavity in the Pecan tree above. At first I didn’t realize what they were doing, but when a bigger bird landed in there and I saw water flying up into the air I knew. Ahh, a refreshing bath. 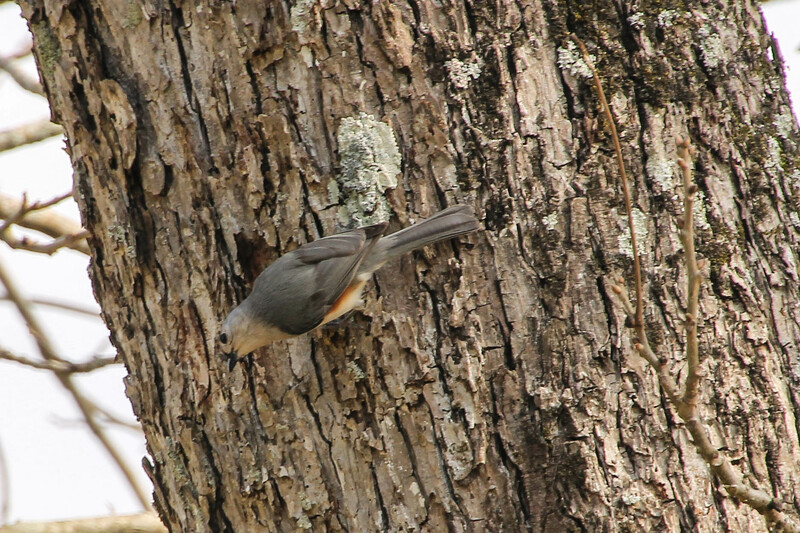 I think the Titmouse was waiting for its turn. When Howard asked my brother if he could put this rope in the tree to assist him in setting up some amateur radio antennas, my brother should have said NO. It kinda takes away from the photo. Just as I am! Every Friday you may participate in Feathers on Friday at Prairie Birder. 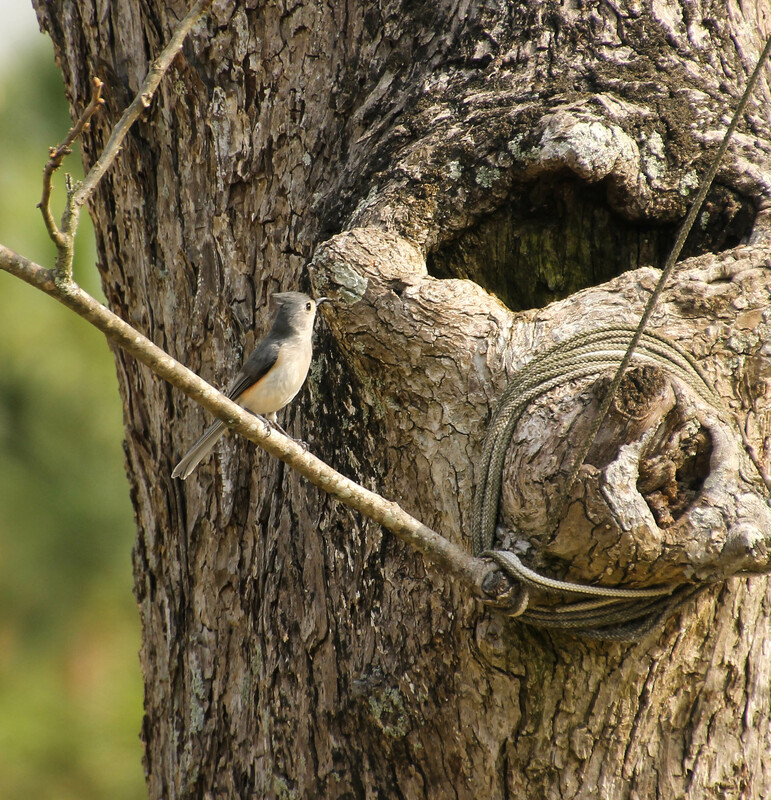 This is another great Blog to learn about Birds! It can be entertaining as well as educational! Note:Some of my information for this post was taken from Field Guide to Birds of North America, Smithsonian Handbook, Birds of North America and Cornell Lad of Ornithology and their website All About Birds. They are so cute and fun to watch. We have some here in Steven F. Austin! Do you miss Georgia? You are probably having too much fun to miss being there.